BANGKOK - As Rakhine state burns and Rohingya flee, Aung San Suu Kyi is preparing to address Myanmar on the crisis for the first time -- a high wire act seeking to soothe global outrage without baiting an army that is again showing its teeth. Suu Kyi took office last year as Myanmar's first civilian leader after 50 years of junta rule. She has since focused her energy on the delicate political dance between her civilian government and the generals who still hold many of the levers of power. On Tuesday the Nobel laureate will give the biggest speech of her time in office. 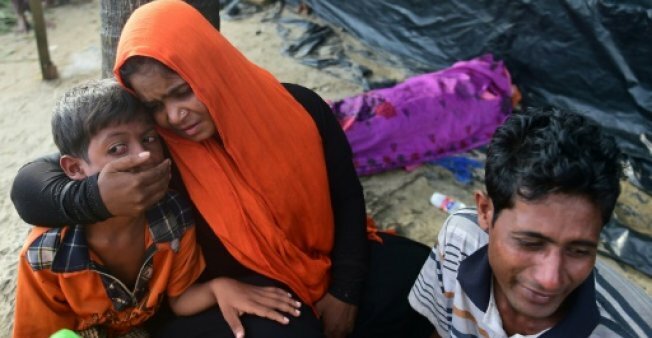 The nationally-televised turn will break a near silence since the ulcerous ethnic and religious hatreds in western Rakhine state erupted into killings on August 25, sending 400,000 Muslim minority Rohingya fleeing into Bangladesh. Some 30,000 ethnic Rakhine Buddhists and Hindus have also been internally displaced. In an interview with the BBC, UN Secretary General Antonio Guterres said the stakes were high for Tuesday's speech, calling it a "last chance" to stop the unfolding humanitarian calamity. "If she does not reverse the situation now, then I think the tragedy will be absolutely horrible, and unfortunately then I don't see how this can be reversed in the future," he said. The latest violence was sparked by Rohingya militants' raids on 30 police posts in Rakhine state. The UN calls the army fightback a "textbook example of ethnic cleansing" with villages set ablaze to drive Rohingya civilians out. Many abroad are puzzled as to how rights can be flagrantly denied to a specific group by a people who once nobly demanded their own in the face of a junta. Suu Kyi's televised address -- likely at least in part to be in English -- comes ahead of a meeting at the UN General Assembly in which Myanmar is expected to be hammered over the crisis. But analysts say her power to stay the military is limited, and her response thus far indicates she is choosing the lesser of two evils. "She's signalling that her chief priority is the relationship between the government and military and that the pogrom is secondary to that," Francis Wade, author of 'Myanmar's Enemy Within: Buddhist Violence and the Making of the Muslim 'Other'' told AFP. "This obviously raises questions about the quality of leadership she seeks to bring, but also that the political game in Myanmar is worth the sacrifice of entire communities." Suu Kyi's National League for Democracy (NLD) swept the board when the military permitted elections in 2015. Before they loosened their chokehold on power, the generals wrote themselves into the constitution, embedding their political future with a bloc of legislative seats and total control over security. Over the last two years, Suu Kyi's gradualism, and her refusal to upset the organisation that kept her under house arrest for almost two decades, has seen the sprouting of the first green shoots of the rule of law in Myanmar. But the eruption of violence in Rakhine and the pressure from the outside world for her to "do something about it" risks upsetting that balance. All the more so in a country where the majority of the population shares the military's view that Rohingya Muslims -- whom it disparagingly calls "Bengalis" -- are interlopers bent on taking land and resources from Buddhists. A leader who bends too far to international will could lose the support of the people she governs. In these circumstances, observers say, it is not hard to imagine another coup by an army that always used national security concerns to justify its iron-fisted rule. From the ashes of Rakhine, commander-and-chief Min Aung Hlaing is emerging as an unexpectedly popular figure, defying deep mistrust of the military. Through Facebook and Twitter he has successfully pitched his once reviled institution as the defender of Myanmar's territorial sovereignty and the Buddhist faith against "extremist Bengali terrorists". On Saturday his Facebook feed repeated the widely-held domestic view that the Rohingya have "never been an ethnic group in Myanmar." With the army flexing its muscles, Suu Kyi's next steps have become increasingly treacherous. A complex swirl of ethnic and religious rivalries, incubated under five decades of military rule, has toxified all debate inside Myanmar around the Rohingya. The militant attacks of August 25 are seen by many Buddhists as confirmation of long-held fears that overseas-based Islamists are intent on taking over Rakhine state -- the western gateway to wider Myanmar. Fear has overridden empathy for the Rohingya, who still trudge in wretched, hungry lines to Bangladesh. So far, and despite the global finger-pointing, Suu Kyi remains a galvanising force in Myanmar. Her reticence to publically defend the Rohingya has been applauded across the political divide -- even by notorious Buddhist nationalist monks. "She is not your leader. She is OUR leader," Mayzin Aye, a businesswoman renowned for supporting Suu Kyi, wrote on Facebook -- where much of Myanmar's discourse takes place. "She is not an icon for us. She is not a Saint for us. She is our country's leader... She gives up everything for our freedom from military rulers."